The hazards of poorly managed litter are well known to poultry producers. Too little moisture can result in dehydration and respiratory illness. Too much moisture leads to litter caking and ammonia, which causes a host of problems ranging from blindness to poor flock uniformity. Good litter management is essential when it comes to managing coccidiosis. Wet litter sets up an ideal environment for the proliferation of coccidial oocysts, increasing the challenge to birds and the risk for coccidiosis outbreaks. In birds vaccinated against coccidiosis, some exposure to coccidia is needed to stimulate immunity. If the litter is too dry, there might not be enough oocyst sporulation to stimulate immunity and make vaccination effective. To adequately stimulate the coccidial life cycle and immunity, a minimum of 25% litter moisture content is needed. On the other hand, if the litter is too wet and oocyst sporulation is too high, birds could be overwhelmed with coccidial challenge before immunity is fully developed. Wet litter can set the stage for development of necrotic enteritis (Clostridium spp.) since bacteria thrive in a moist environment. When devising a plan to control litter moisture, keep in mind that birds are continuously adding moisture to the house. As a general rule, birds drink almost two pounds of water (about one quart) for every pound of feed they eat. If 24,000 four-day-old birds eat approximately 1,000 lbs. of feed daily, they will drink close to one ton of water daily. As birds get older, feed consumption increases dramatically "and so does the amount of water they drink. By the end of a 7-week growout, a house with 24,000 birds has consumed over 100 tons of feed and well over 200 tons of water! Where does it all go? Less than a third of ingested water is retained by the birds. The rest is exhaled into the air in the form of water vapor or deposited into the litter. When a grower operates exhaust fans, the moisture-laden air in the house is replaced with drier outside air, thereby removing water from the house. The drier air that the fans bring into the house will not only pick up water that the birds are placing into the air but also remove water from the litter, keeping it drier. Of course, if a producer does not operate exhaust fans enough, water will build up in the air as well as litter leading to house sweating and litter caking. When it comes to removing moisture from a house, it is important to know that the amount of water that air can hold varies dramatically depending on temperature. The term humidity is used to describe how much water is in the air. For instance, if the humidity is 100%, we know the air is holding all the water it can. If the humidity is 90% the air can only pick up a little water from the litter and litter caking is more likely to occur. If the humidity in a house is 40%, it is capable of picking up a lot of water from the litter. Because the amount of water the air can hold changes with the temperature, relative humidity is a better term than humidity. For instance, 1,000 cubic feet of 40°F air can only hold less than eight ounces of water, but 1,000 cubic feet of 85°F air can hold about 32 ounces. At 150°F, 1,000 cubic feet of air can hold an entire gallon of water. The fact that hot air can hold more water than cold air is why we use hot air when we want to dry something off, such as wet clothes in a clothes dryer. As a general rule, the moisture-holding ability of air doubles for every 20 degree rise in temperature. If 1,000 cubic feet of 40°F air has 100% relative humidity, it holds approximately 6 ounces of water. If the temperature of that air is increased by 20 degrees, the moisture-holding ability of the air doubles and it can now hold about 12 ounces of water. Since the air now has only half the water it's capable of holding, the relative humidity is 50%. Let's heat the same 1,000 cubic feet of air another 20 degrees to 80°F. There is still only less than 6 ounces of water in the air, but now the air is capable of holding about 24 ounces of water. Therefore, the air is only holding 25% of the water it can, and the relative humidity is 25%. So, can you dry a house when it is cold and rainy outside? Yes you can, because as you warm the air to the proper house temperature you are increasing its moisture-holding ability and the relative humidity of the air decreases. Since the air can now hold more water, it can remove more water from the litter, keeping the house drier. The key to drying cold wet air is to make sure that all incoming air is brought in through air inlets that directs the air toward the ceiling. As the fresh air moves along the ceiling, it is heated by the hot air produced by the birds and brooders/furnaces that tends to collect at the ceiling due to the fact that hot air is lighter than cold air. The longer that incoming air can be kept at the ceiling through maintaining the proper static pressure and inlet opening, the more the air will heat up and dry out. Maximum heating and drying of air is obtained if the static pressure and inlet openings are set so that incoming air stays at the ceiling until it has reached the center of the house. Another way to promote litter moisture control is through the use of small circulation fans that are 18 to 24 inches in diameter. Circulation fans can help bring in drier air from the ceiling gently down to floor level; water is picked up from the litter, which keeps the house drier. Of course, if exhaust fans are not operated enough, moisture in the air and litter can build up. Circulation fans, if operated properly, should not cause a draft at bird level. Generally, they should be controlled with an interval timer or variable speed controller. Interval timer settings or speed can be adjusted according to house conditions. If there is significant temperature stratification or the litter needs additional drying, timer settings or the speed of fans can be increased. If the litter is very dry, the use of circulation fans can be decreased. 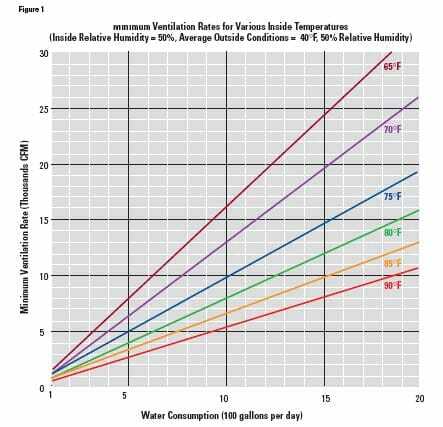 To determine how much fresh air is needed, use the chart (see Figure 1) that provides the required minimum ventilation rate to get rid of moisture. It is based on how much water the birds are consuming, the inside house temperature and an average daily outside temperature of 40°F. The minimum ventilation rates that are determined from the chart should be viewed as a starting point that may need to be increased or decreased according to a variety of factors such as the type of waters used and how tightly the house is constructed. One of the best ways to figure out if adjustments are needed to minimum ventilation fan settings is to monitor relative humidity in the poultry house. Ideally, relative humidity should be between 50% and 70%. If it is below 50%, the litter may become too dry and minimum ventilation fan settings should be decreased. If the relative humidity is above 70% for a prolonged period, litter caking and house sweating can occur and minimum ventilation fans settings should be increased. Let's look at some examples of how to keep litter dry based on what we've discussed so far. Say a producer has older birds "which produce bigger, wetter droppings and are kept in lower temperatures than younger birds "that the house temperature is 70° F and the relative humidity is 65%. You start noticing that the litter is getting a little damp and want to dry it out before it slicks over. First, you try turning down the timer fan thermostats to 65°F to bring in more air. Since the air temperature is lower, the moisture-holding ability of the air decreases, and the relative humidity would increase to about 78%. This will make it more difficult to remove water from litter. Yes, you would bring in more air, which would help to some extent, but the downside is that higher relative humidity will make it more difficult to pull out water from litter. In contrast, let's say we increase the house temperature just 3° and leave the timer fan settings the same. The relative humidity will decrease to approximately 58%, making it significantly easier to draw water out of the litter. Another option would be to leave the house temperature the same and turn up the timer fan settings. This would work provided we do not let the house temperature fall. In some instances, this means adding heat to the house to maintain the desired house temperature. The key to keeping a house dry is the quality, not quantity, of air. Bringing in a lot of cold air and letting the house temperature fall usually is not as effective as bringing in a moderate amount of air and warming it up. Contrary to common belief, using warm air to dry out litter does not always mean increased heating costs. As outside temperatures increase during the day, the moisture-holding ability of the air increases. Take advantage of that fact. During the day when the sun is out and the air temperature is warmer, increase timer fan settings to capitalize on relatively drier air. Cold weather is considered a time of year when controlling litter moisture is a big challenge, but hot weather can present problems too. Even though evaporative cooling pads and fogging nozzles can decrease air temperature in a house by 10° to 20°F, they can also raise the relative humidity of the air to above 80%. Why? For every one degree of cooling produced by an evaporative cooling system, the relative humidity of air will increase by about 2.5%. Excessively high house humidity can be minimized by making sure that evaporative cooling pad/fogging systems are set to operate no lower than 82°F. There's one other important way that excessive litter moisture can be kept to a minimum, and that's by making sure that the evaporative cooling system does not operate after 10pm or before 9am in the morning. These are times when outside humidity typically is above 80%, which limits the amount of cooling to be produced by pads and/ or fogging systems. When evaporative cooling systems are operated between 10pm and 9am, they do little to cool the air and tend to saturate incoming air with moisture, increasing the chance of excess litter moisture and all its inherent problems.